Asia Symbol (Guangdong) Paper has commissioned Valmet-supplied fine paper production line in China. The new production line PM 12 has been installed to produce fine papers. It is expected to help increase Asia Symbol’s ability to produce value-added products, Valmet said. As part of a deal signed earlier, Valmet was responsible for the supply of complete fine paper making line from stock preparation to reel with an approach flow system, white water systems, air systems, and clothing for the whole machine line as well as a winder. The automation package includes Valmet DNA process, machine and drive controls and conditioning monitoring as well as Valmet IQ quality control system and profilers. The scope of the contract also included wet end analyzers. Valmet said that the automation solutions allow Asia Symbol to optimize the entire production process and the end product quality for maximized business results. Valmet senior project manager Jari Laine said: "The start-up itself was smooth: the machine is operating well and the number of web breaks has remained very low. With production of approximately 1,700 tons per day and the design speed 1,800m/min, the new machine is designed to produces wood free uncoated paper grades in the basis weight of 80 g/m2. Asia Symbol currently has production capacity of 1.8 million tons of pulp, 1.0 million tons of fine paper and 470,000 tons of paper board, annually. 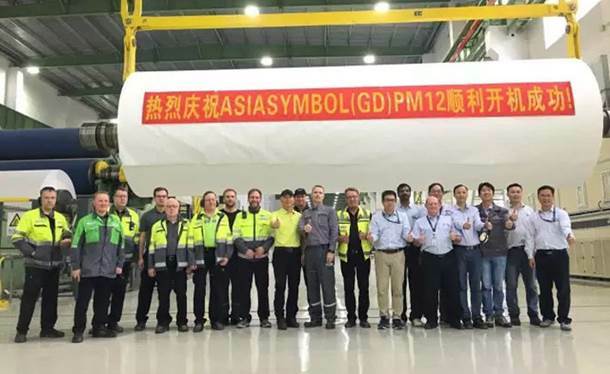 Image: Valmet’s paper making line PM 12 was installed for Asia Symbol in China. Photo: courtesy of Valmet.